Brackston is no stranger to writing witch novels. She’s set one in the 17th and 19th century, and now she tackles the time around World War I. I think Brackston’s writing style is one that you definitely have to like, but she can write an amazing novel. The Midnight Witch took a little while to get going, but once it did, I couldn’t put it down. Lilith is the daughter of the 6th Duke of Radnor. Her father is also the Head Witch of the Lazarus Coven. When he dies, Lilith’s brother becomes the 7th Duke of Radnor, and she becomes the Head Witch. From the beginning, her reign in challenged. People aren’t sure if a young female can truly lead the coven. But she has support and eventually gains the respect of the other witches. At the same time she’s learning how to lead, a group of sorcerers are trying to get the Elixir, the secret the Lazarus coven protects. She’s also learning what it’s like to fall in love for the first time. With the threat of war looming, Lilith must learn how to balance all areas of her life before everything she works to protect is gone. I like Lilith. She knew what she wanted, and even though she had moments of self-doubt, she never backed down when she knew her choice was right. She’s up against great odds, in all areas of her life, but she tries to keep that from overwhelming her. She learns to balance her duties and her desires well. She’s not the typical woman of the time and she knows what it’s time to adjust her ways of thinking to fit the times. Bram, the love interest, wasn’t my favorite, but he wasn’t horrible. He was devoted and hopelessly in love, even if it felt like it happened a little fast. This might be because we don’t get to see all of their interactions before they declare love, so it didn’t bother me too much. Louis, the man Lilith is engaged to, isn’t too bad either. It’s easy to see how much he loves and cares for her. They’ve grown up together and that’s given him the time to develop feelings for her. It’s clear to see both men will help Lilith in whatever way they can, whenever she needs them. The storyline was interesting. It started a little slow, with a lot of set-up taking place. I can appreciate it, but it still felt a little slow. Once things began happening, however, I couldn’t stop reading. I had to know what was going to happen next and there was never an easy time to stop. There was always a reason for me to keep reading. 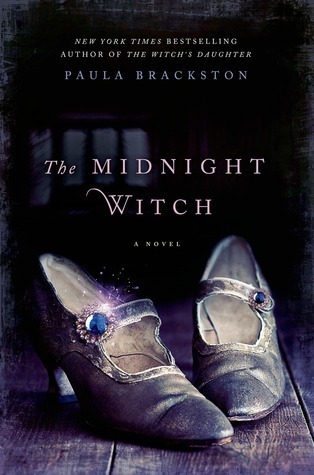 Brackston has another great book on her hands with The Midnight Witch. It might take a little while to get into it, but once you get drawn in, it’s hard to break away. The Midnight Witch takes on a different tone than her other novels, but it’s still just as wonderful. Thank you to NetGalley and St. Martin’s Press for an advanced copy of the novel in exchange for an honest review. This entry was posted in Historical Fiction, Something a Little Different and tagged Fantasy, Historical Fiction, Paranormal, Paula Brackston, Supernatural.